J.S. 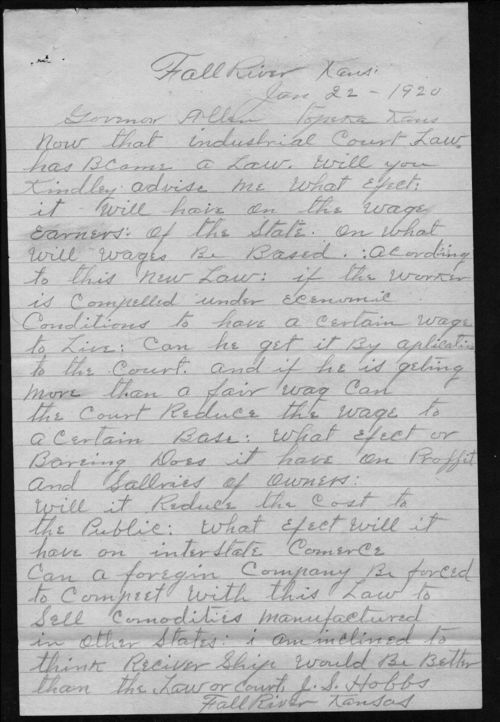 Hobbs writes to Governor Allen with questions about the newly created Industrial Court. The Court of Industrial Relations was created by special legislation in January 1920 following a series of coal strikes in Southeast Kansas. The court lasted only a few years when it was declared unconstitutional by the United States Supreme Court. Call Number: Governors Office Correspondence, Governor Henry Allen Box 12, Folder "H"